Hotel Californium! Sucking me in again with the EPA jousting the NRC. 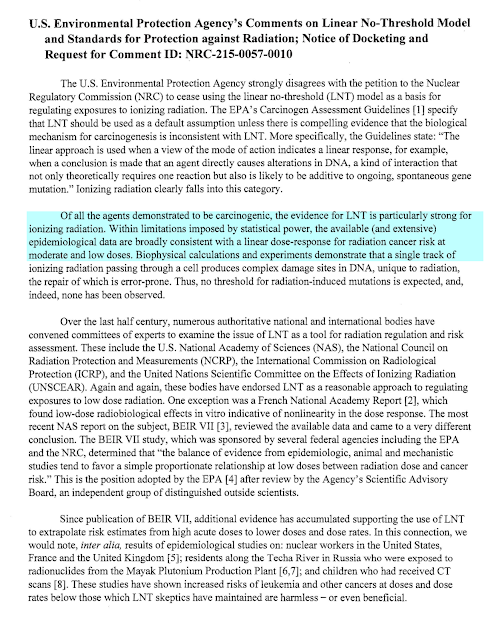 Even though LNT is not "fact" is not "correct" it helps set a reasonably low safety measure for radiation exposure. So it doesn't have to be perfect. For those who are confused by LNT, here it is in a nutshell. They took health results from the 2 nuclear bombs dropped on Japan and then extrapolated a line down to the zero Y and zero X axis. and then far far away from the huge exposures of the atom bombs, they used the atom bomb data to set safety levels for much lower levels of radiation. So it's actually a bit of stretch of logic at best. But it set a level that it "pretty OK". By NRC wanting to throw out LNT, there is a basis of logic for that. But the insanity comes when they want to replace LNT, with Hormesis "Radiation is good for you, up to 100 times the radiation allowed now". That is 100mSv. I think even the nuke cartel does not believe this would be wise, but that this is a ploy to say "lets make a compromise, and make 20mSv per year the new standard". Nuclear plants are dying like flies, and worldwide, they make about $400B in profit for their owners, so they can throw a lot of money at trying to slow the death rate of the existing plants, whilst getting Obama to throw in money for the "next generation" research. So yes, keeping LNT is much better than throwing LNT out and replacing it with 100mSv hormesis. In the perfect world we would replace LNT with something even stricter, a "supra linear" model. That won't make sense to most people until you see it in a chart form. But basically, repeated long term attacks by small levels of radiation, especially man made radiation, can be much more damaging than 1 large attack that doesn't cause immediate permanent damage. Consider the example of a person walking out there apartment door and getting mugged, beaten to the ground, kicked, but not permanently damaged. Then that person experiences no bad attacks for 5 years, instead committing thenselves to physical training and healthy probiotic eating. Now compare that to a person who walks out the door of their apartment and a group of bullies give them a solid hit that bruises them but doesn't knock them to teh ground. And the next day they strike again, sometime hitting the same bruised areas. This goes on for 5 years. Who do you think is in better shape after 5 years? I think it is a fitting analogy. And it should also be obvious what happens if they throw a banana at you every morning, you take the banana, make a smoothie and end up healthier. OK I had to throw that in there for Codeshutdown, LOL. 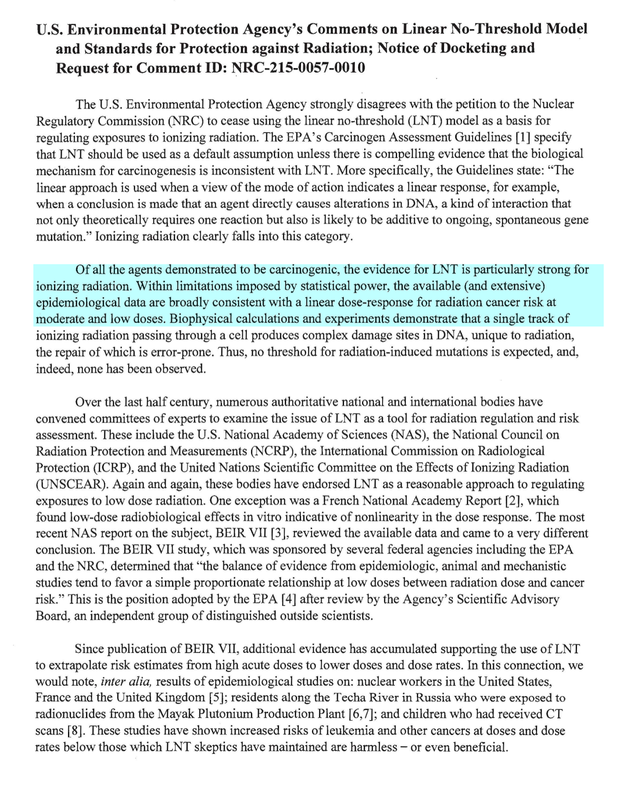 Their comment "LNT for regulatory purposes" goes counter to antinuclear use of LNT to estimate virtual deaths. This is an important distinction that people like you convieniently skirt. If you accept EPA then you have to accept LNTs limitations that fall short of antinuke misapplication. Maybe the dialog helps people distinguish that LNT isnt to be used to estimate deaths afterall. Then Yablokov, Gundersen, Caldicott, Busby, Mangano, Sherman, and any antinuclear "scientist" will take heed. Even your million chickens which doesnt even apply will be seen as foolhardy attempts to demonize radiation and nuclear. At the end of the day only 40 deaths have been attributed to nuclear and it will be seen as another industrial and not widespread hazard. Asshat, you have lost your humanity if you ever had any. The regulatory does not go "counters" to death estimates, they are simply different matters. Lies like "only 40 deaths" will get you 3 strikes toward hell on the scorecard. There is no difference in a K40 atom whether it comes from within your body or from a nuclear reaction. It still emits a highly energetic photon. Your shite that makes no sense, the stuff that makes no sense will be eliminated, and eventually you will be banned. Either contribute, but these stupid 10 seconds of non applicable pot shots pretending to be a post are not worth anyone's time. None of your stuff makes sense. Ive tried and tried to educate you in nuclear but you seem to go down your own rabbit hole, seeking your own "tipping point". I cannot assuage your irrational fear campaign. Im coming from the background of seasoned experience in these matters. Gundersen doesnt hold a candle to what I know or can do. I am continually updating my skill set. You know there is no short cut to subject mastery than real professional practice. You are a professional blogger I'll give you that. Im a professional nuclear engineer. There is a difference. EPA say LNT for regulatory purposes and regulators are not in the business of determining or predicting deaths. You know this to be true. You also know the NRC really had no intent to go against LNT as regulatory model. Thus this whole exercise was meant to bring the "no safe dosers" to their knees. You are also aware thay there are over 100 new nuclear plants under construction world wide. Thats the real tipping point. You cant stop it either. I can come back 5,10, 20 years if I am still on the planet and it will be the same song. I represent state of the art in nuclear and you are locked in antinuclear paradigms that although valid for their initial inquiry viz rad health, waste, safety, are no longer valid and seen as somewhat pedestrian. I tried to help you comprehend the bigger picture of it all but it seems you are trapped in minutae. As an engineer, I feel somewhat sorry for your loss of humanity or the desire to solve challenges rather than shout at the rain and target those of us that are actually doing something to bring real understanding to the masses. OK you failed, go find a different venue. "NRC really had no intent to go against LNT as regulatory model. Thus this whole exercise was meant to bring the "no safe dosers" to their knees"
That's one of the dumbest things I've ever read. The NRC wouldn't have taken the Petitions on hormesis if they weren't serious about them; and they've wasted a lot of tax dollars in doing so. "The EPA cannot endorse basing radiation protection on poorly supported and highly speculative proposals for dose thresholds or doubtful notions concerning protective effects from low-level ionizing radiation." Repeat: "poorly supportive" "highly speculative" "doubtful notions"
Wasn't Loose Kook one of those who claimed there's no damage seen under 100 mSv .... even though a quick search over at the National Institute of Health website brings up hundreds of studies showing deleterious effects UNDER 100 mSv. Loose Kook also said there are 100 plants being built worldwide. That's an exaggeration. The amount is around 70, but we'll see how many are cancelled due to exorbitant costs and delays. Loose Kook also said he is trying to bring "real understanding to the masses" yet he hasn't even updated his knowledge on how dangerous radiation UNDER 100 mSv is. Ya Loose Kook is really the poster boy for the failing Nuke Industry. An ignorant savage spewing lies. Say what you want to say. I never said radiation below 0.1 Sv acute carried zero risk. The NRC was obliged to consider the petition in the sane vein they would consider Beyond Nuclears petitions. Talk about a waste of taxpayer dollars. They should charge Beyond Nuclear their going man-hour rate for even considering their positions. Now you know that the NRC or EPA wont use LNT to establish death estimates since that was never the intent if the hypothesis. And it remains a hypothesis because you can never really prove it. People drew the extrapolation based on a need to apply practical regulation. We know that low low accumulated dose is not cumulative in its effect just by the differences in cancer rates in high background cities that are counter intuitive. All you rat farmers have is your fringe site. The cult of the antunuke even justifies Dana's actions. Now thats the real kook. Loose Kook is emblematic of the pro-nuclear gangsters, who make a good salary polluting the environment and causing illness and death via nuclear energy and nuclear pollution. Loose Kook also loves to criticize ENENEWS and "stock" but can't seem to stay away from either of them, even though he embarrasses his beloved pro-nuclear- platform with his comments.